Take your child on a tour of our galactic neighborhood with this personalized space book. Your little one may be the center of your universe, but why not take them on a tour of our galactic neighborhood with this personalized book of solar system science? Along with their alien family, your child becomes a curious extraterrestrial traveller, visiting our sun and nine planets on an unforgettable vacation. Along they way, they'll learn far-out facts and amazing trivia that makes astronomy friendly and fun. Your child's name is thoughtfully incorporated into each image inside the book and featured on the cover (up to 12 characters). To top off this stellar adventure, personalize the book with a special message (up to 80 characters) on the title page. Made in the UK. They're SO excited to be IN the story!! We got this book a little prematurely (he's too young to care about /retain facts) but he loves hearing his name and following the story. It's great though because he'll treasure it until he's older and then he can learn from it!! Gave it to my son as he loves to read and loves learning about space. Who doesn't love personalized items? I gave this product as a gift to my nephew who loves and is into space. It should be noted that the child in the story (customized) goes on an adventure with their mom and dad. I am a single mom and was so excited to give this to my space loving daughter. But now I can't, as it doesn't reflect our family. A heads up on that would have been great. the little boy who received this gift is a smart cute cookie. I think personalizing this item adds more fun and imagination to the story. He can invision himself in the story, traveling through space, learning along the way with the characters about our solar system. 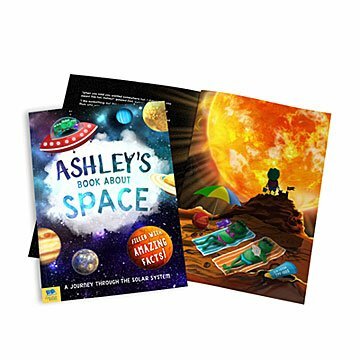 A great unique gift that will help a child learn to read and learn about space!